"Aunt Becky's already gotten her moment in the sun." 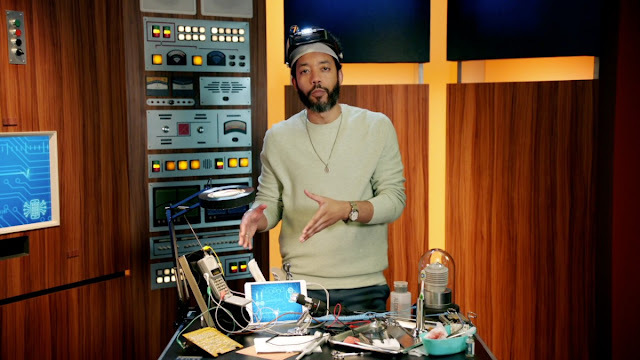 Comedian Wyatt Cenac's dryly satirical comic sensibilities lend well to the serious but easily overlooked social issues he explores in his weekly late night public television style HBO docu-series, Wyatt Cenac's Problem Areas. As the title suggests, Cenac and his talented team of producers take an educational approach to their cultural commentary in breaking down different complex topical subjects. Not unlike Last Week Tonight, Problem Areas, examines various complicated, in-depth topics through multiple perspectives. However, unlike colleague John Oliver (also an executive producer), this show takes a much more activist or documentarian approach to its multimedia stories while balancing touchstones of more traditional late night comedy fare. Stylized direct-to-camera interviews are inter-spliced with Cenac's own in-studio comedic commentary (think 1970s era PBS) and his more serious docu-footage captured through field segments filmed across America that's clearly influenced by another of the show's credited producer's work, award-winning documentarian Ezra Edelman. Problem Areas never takes the easy route to its news stories as it judiciously factors in our inherent internal biases and blindspots to further contextually shape any issue beyond its superficial talking points. Each episode dissects specific parts of American issues within a broader, familiar stream of public discourse. Last year, Cenac's first ten-episode season explored different but related angles to matters of policing in relation to enforcement, abuse, race, sentencing, and imprisonment. This year, the show dives deep into teachers, unions, local governance, school safety, and poverty within the framework of education reform. Problem Areas proves itself to be must-watch material thanks to Cenac's ambitiously entertaining and informative approach to sharing weekly topical documentary subjects. The show offers some answers but mostly gives an abundance of educational value in how it expresses complex topics fluidly. He and the show explore common problems in new ways to reveal even more depth to the pressing issues of our time. Season two of Problem Areas is currently airing Friday nights on HBO and season one is available for streaming on Crave.